Starting out at famed Tsinghua University, its namesake TusPark has grown to become home to high-tech giants and spawned more than 30 branch operations around China. Since its founding, TusPark has occupied a "commanding height in the Haidian Science Park", said Chen Hongbo, senior vice-president of TusPark Co and vice-dean of the Tsinghua University TusPark Research Institute for Innovation. TusPark Co, an abbreviation for Tsinghua University Science Park and known in Chinese as Qidi, was established in 2000 as an evolution of the TusPark Development Center built in 1998. The company is in charge of development, construction and management of the entire Tsinghua Science Park, located at Haidian Science Park (HSP), which is itself at the core of the Zhongguancun national innovation model park in Haidian district. Chen, who is also director of the Beijing office of the International Association of Science Parks (IASP), said the close relationship between TusPark and the Haidian district government has greatly assisted TusPark. He noted TusPark naturally evolved in Haidian. "We were established by Tsinghua University, one of the top universities in the Zhongguancun innovation demonstration center," Chen said. As business grew, two of TusPark's enterprises - Digital China and Sinovel - have reached annual revenues surpassing 10 billion yuan. Digital China was listed in Hong Kong in 2001. "We do not compete with foreign science parks, we cooperate with each other," Chen said. "HSP has the best international stage for that." He added that foreign science parks are generally smaller and have fewer services. Chen said collaboration with other science parks, such as that run by Peking University, is also crucial to success. "We have different focus and advantages, just like Tsinghua University and Peking University are different but both are great," he said. "Our goal is to do well in what we want to do," Chen said. For its part, TusPark provides its resident companies with professional services such as registration, capital investment and assistance in protecting intellectual property rights. Chen said the operation has to first become big, then strong. It aims to establish systematic and stable services at this phase of its development. 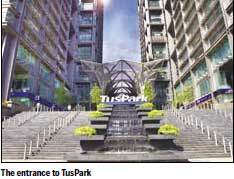 "We hope that one day a world No 1 company will introduce itself as coming from TusPark," Chen said.